Time to read: 16 minutes (based on 150 wpm). Communication is the act of transferring a message from one person to another. The message is transferred following a predefined scheme, called language. The message “travels” over a medium. You can find more information on the topic in Wikipedia: Communication. Verbal communication can be written or oral. Non-verbal communication is body language, appearance, voice tone. Formal communication conforms to predefined rules. Informal communication consists of casual talk, sending friendly email to colleagues, hugging a friend when you meet them and so on. Communication theory studies the verbal-formal and verbal-informal types of communication. Business communication is the process of sharing information within an organization or outside an organization. It is done usually for commercial benefits. You can manage each of those fields better, when you understand communication theory. 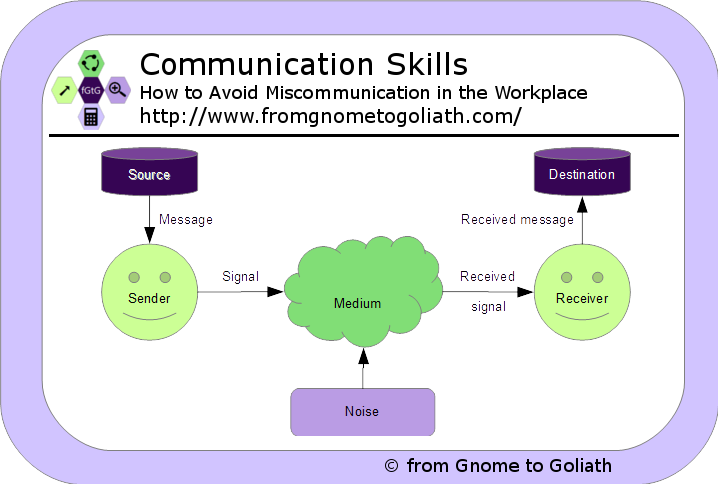 Having good communication skills in the office, could lead to lot more recognition and success in general. This is one of the theories that try to research and explain communication. Once again, consider Wikipedia, if you are curious about details: Communication theory. Source – produces a message to be communicated. Message – a statement that is sent in a verbal, written or any other form. Sender – the person who encodes (using a “language”) the Message into a Signal. Signal – what the Sender sends to the Receiver. Medium – where the Signal travels. It could be air, paper, the Internet and so on. Noise – any interference over the Medium, which might cause the Signal to be distorted. Received signal – what the Receiver ultimately receives (potentially changed by Noise). Receiver – the person who decodes the Signal into the Received message. Received message – this is how the Receiver decodes the Received signal. Destination – the person for whom the Message is intended. Describes a simplified model of communication. The Sender needs to communicate something (coming from the Source) to the Receiver. After encoding the Source to a Signal, the Sender sends it over the Medium. During the time it takes the Message to reach its destination, the Signal is potentially distorted by the Noise. The Receiver picks up the Received signal and decodes it. Then he or she gets the Received Message and passes it to the Destination. In this section I am going to review two examples of communication. I will then show, how using communication skills and understanding of communication theory, can prevent miscommunication. Peter wants to ask John to generate a report with the latest sales results for a particular product (Product A). Source: Peter needs a sales report on Product A for an upcoming presentation. Peter thinks that John can do that report. Message: John, could you please send me a sales report on Product A for last year. I am sorry to bother you so early. Could you please generate and send me a sales report on Product A for last year? I have a shareholder meeting later this week and I would like to present the latest results. The format is not important, but if you could do it in Excel that would be great. Please let me know if there is anything unclear! Noise: Corporate email and other traffic. Received signal: Email, changed by Noise. Received message: I need to prepare and send an Excel file with sales report in Product A.
Destination: John has to sit down, prepare and send a sales report on Product A. Let me use communication theory on the example and analyze the outcomes. … Peter has no authority over John? Probably, John would receive the message and do nothing. … John is not responsible for Product A at all? Then the whole assumption would be wrong and Peter would have to find out who can do that. … Peter wrote “John, could you please do a sales report on Product A.” and forgot to specify that John has to send the report back? Then probably John would do the report and upload it somewhere, like he usually does. And Peter would never receive it because he would expect an email from John. … Peter did not mention the time period of the sales report? Peter could receive something which is not needed or helpful. … Peter did not have enough time and simply wrote: “John, I need a sales report on Product A”? John would look into the database and send back the last generated report. Peter would not be happy because he wanted a new report with the latest data. … Peter did not specify the format of the report? John would assume the format that is easiest to do and Peter could receive the report in text file rather than Excel. … Peter used the corporate instant messenger to send the message and John never uses it. Peter would wait for the report for days and may not receive it. … instead of receiving “Product A”, John received “Product B”? John would do the report, send it back to Peter. And after that it would turn out that he has to do another report, but for Product A. … instead of John, Juliana received the email? She would most probably ignore it and Peter will wait for days. ... John received the message, created the report, uploaded it to the shared server and replied: “I did it!” to Peter? Peter would not be happy, because he would not receive what he wanted, even though John had done what he thought was right. … John received the message and created a report for Product A, but from Product Line X, which was not intended? Peter would again receive something that was not needed. Jane is a project manager and she needs a shared resource for her project. She wants her colleague Bill to write a database script for her project. Source: Jane needs a database script to be prepared for her project. She thinks that Bill can do that. Message: Bill, I need your help as database expert for one of the tasks of Project ABC, between 01.05 and 09.05. Jane: Hi Bill. How are you? Bill: Hi Jane, I am very well. How about you? Jane: I am wonderful. Listen, I am leading Project ABC and for one of the tasks, I need a database specialists. I value your skills and I think you are right for the task. Our initial estimation is about 5 man-days. Can I count on you between 01.05 and 09.05? Bill: Sure Jane. I will be available. Jane: Would you repeat it, just in case. Bill: Project ABC, between 01.05 and 09.05, database script implementation! Noise: Other colleagues that talk around Jane and Bill. Received signal: The request from Jane, potentially distorted by noise. Received message: I need to do a database script for Jane between 01.05 and 09.05 and I need to mark it in the calendar. Destination: Bill has to mark in the calendar that he is busy between May 1 and 9. And he needs to inform his manager. Once again I am going to use communication theory to analyze what could have gone wrong with the conversation. … Jane had no authority over Bill? Probably, Bill would receive the message and do nothing. … Bill is not a database specialist at all? Then Bill could do the job, but fail to deliver on the expectations. Or he might not be able to do it at all. … Jane forgot to mention the dates when she needs Bill? Then it would not be a surprise if Bill did not show up. … Jane did not mention the project she was working on? Bill could have a totally wrong assumption of the task. For example he could be thinking of low risk, internal project and Project ABC could turn out to be a critical, external project. … Jane did not mention that she values Bill’s skills? Bill could ask himself “why me?” and either reject the task or accept it, but do nothing. … Jane tried to whisper the discussion with Bill during a corporate meeting. Bill could be paying attention to the meeting and could ignore to hear the request. … instead of Project ABC, Bill heard Project BCA? Bill could assume that he will be working on a completely different project. … instead of 01.05 and 09.05, Bill heard 01.07 and 10.07? He will update his callendar, but when needed he will not show up. ... Bill understood that Jane needs a database specialists to install an instance of SQL Server? He could refer a colleague of his, who has no idea how to do database scripts. 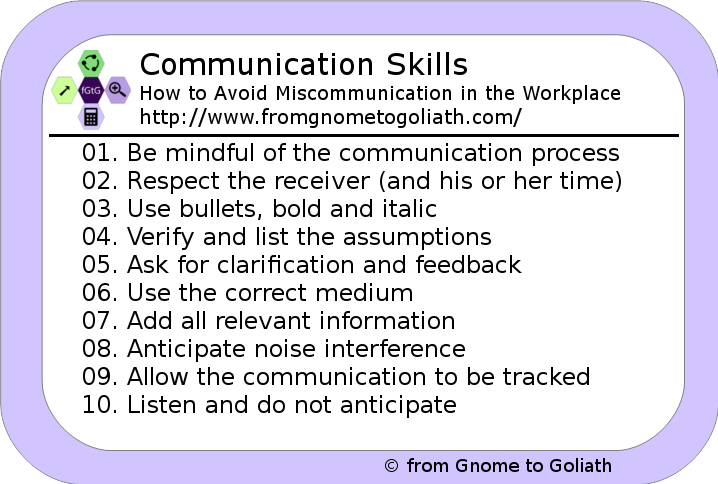 Based on the examples above, you could improve you communication skills and reduce the miscommunication, by following these tips. Be mindful of the communication process. If possible, try to break down the different parts using communication theory and analyze what can be improved. Plan carefully what you are going to say. Have you considered all relevant information in the message? Have you encoded the message using a shared language? Did you ask for confirmation from the other side? Did you receive confirmation from the other side? Respect the time of the receiver. Do not send him really long messages, but also try to be as specific if possible in order to get what you wanted. Have you provided all the relevant information to the receiver? Did you include too much information? Did you contact him or her in a time that is suitable for both sides? Use bullets, if you want to list several requests. The receiver can use them as checklist. Have you cleared for yourself what exactly you want? Did you list the bullets in an actual list or in a long sentence? Did you emphasis the words that felt most important to you? Use bold and italic to emphasize the important parts. Make sure that the receiver can do what you want them to do. Check if you are not bypassing the chain of responsibility. Are you sure that the receiver is exactly the person who you look for? Have you written/said why you reach out to the receiver? If you are the receiver and if you see there is something wrong, ask for clarification. That would save both your own and the sender’s time. Add a “please do not hesitate to contact me, if there is anything unclear“. Try to get the other party to tell you, what they understood. You will be able to catch a lot of errors. Send a “could I disturb your for second” message over the instant messenger before interrupting your colleague with a question. Observe the culture of the company. Some companies prefer written communication, others – written. Do not assume that the other person has received and decoded the message correctly. Especially if you are outside and there is loud noise. Or if he or she is not a native speaker. Consider writing down an email (or memo) after an oral conversation. List all the assumptions that you had before the conversation. List all outcomes of the conversation as you see them. If you are the receiver of the communication, actively listen to the sender. Be mindful of your body language and do not discourage the sender even if you do not agree with the information that you receive. Lists 10 tips for improving your communication skills. Communication is what you are doing every day to interact with the other people around you. Communication skills is what could help you achieve more with less and stay competitive in the current dynamic environment. And last but not least, communication theory can teach how to become more efficient when communicating. You will be able to tell the others what you want to tell them. And on the other hand, you will understand better what they are tying to tell you. By getting familiar with the simplified concept of communication theory you can improve your understanding of the whole process. If you keep in mind what you learned in this article every time you have a conversation, you will increase your changes of getting the most out of it. Your career and your relationships will also benefit from the knowledge.